It's not every day you get to see a man scale a building like Spiderman to save a child, but that is just what onlookers witnessed in Paris, France. 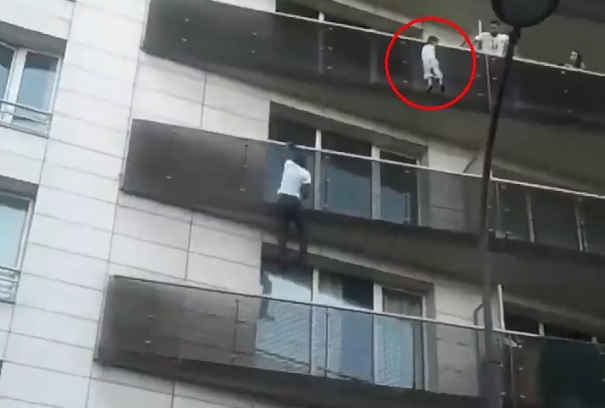 A 22-year-old Malian immigrant scaled four stories like it was nothing to reach a four-year-old child danging from the balcony. Mamoudou Gassama took only a few seconds to scale the four-story balcony and reach the child in a spectacular rescue that has gone viral. The daring rescue took place around 8 p.m. Saturday in northern Paris when Gassama scaled the high rise to save the toddler. The footage shows Gassama pulling himself up from one balcony to another four times with his bare hands. If you have ever tried doing a pull up you know it is not easy to pull your own weight up yet Gassama manages it with ease. By the time firefighters arrived, Gassama had already rescued the child. A fire service spokesman said, "Luckily, there was someone who was physically fit and who had the courage to go and get the child." Gassama was tracked down by reporters who got an interview. "I saw all these people shouting, and cars sounding their horns. I climbed up like that and, thank God, I saved the child," Gassama said. "I felt afraid when I saved the child … when we went into the living room, I started to shake, I could hardly stand up, I had to sit down." The mayor of Paris Anne Hidalgo praised Gassama's daring rescue on Twitter and called him personally to "thank him warmly". Hidalgo said, "He explained to me that he had arrived from Mali a few months ago dreaming of building his life here. I told him that his heroic act is an example to all citizens and that the city of Paris will obviously be very keen to support him in his efforts to settle in France." why don't we get immigrants like this in America? everyone already knows that monkeys are good climbers. Well done to that man! Want him on my team any day!